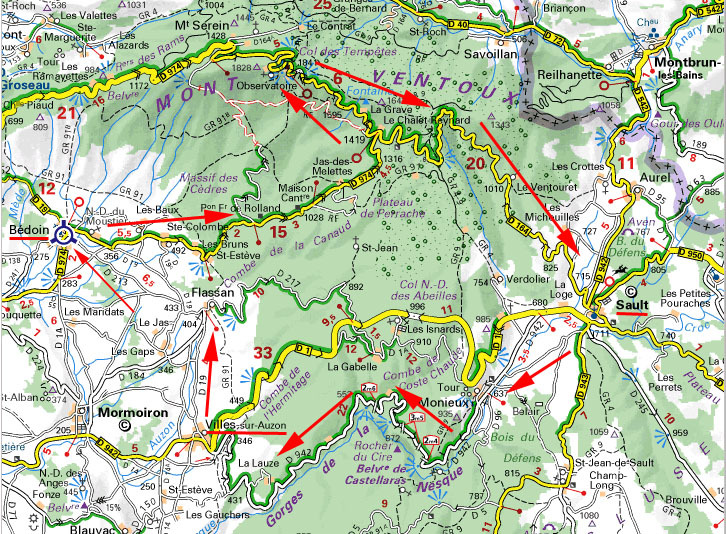 After a 5 month break from posting descriptions of our cycle-tours, this overdue report should be timely as preview for tomorrow's stage 4 of the Critérium du Dauphiné Libéré, which finishes on the Mont-Ventoux. Last summer, I cycled it on two separate occasions with photos and videos from my return visit appearing in the gallery below. 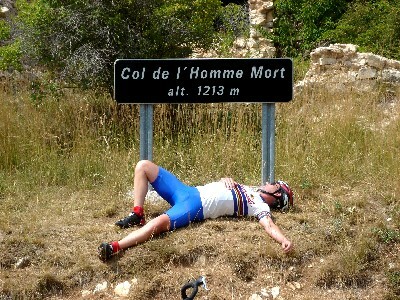 There is a lot to describe in Provence, but a full review will have to wait a bit longer. 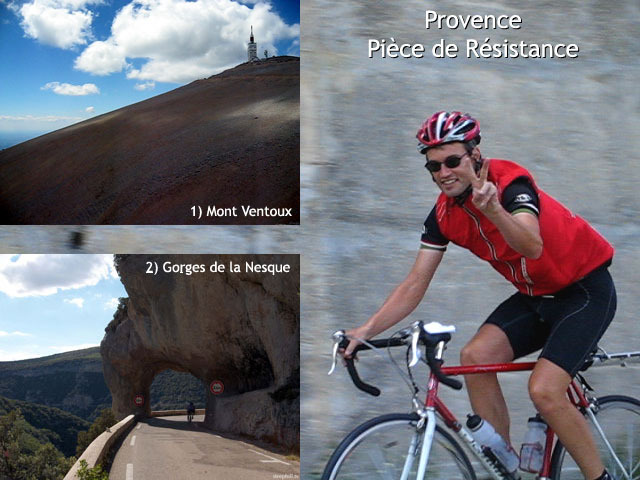 Today, the focus is on the region's two most spectacular cycling attractions, Le Mont-Ventoux and Gorges de la Nesque. As one of the world's most famous cycling climbs, the Mont-Ventoux doesn't need much introduction. The Tour de France and, to a lesser degree, the Critérium du Dauphiné Libéré have a lot to do with its soaring popularity. But, it's a tough cycling climb that can stand on it's own... literally, because the telecommunications tower at the summit is visible from long distances in any direction like a god overlooking its cherished landscape. (In 1882, a meteorological station was constructed on the summit, though it is no longer in use. In the 1960s a 50 m-high telecommunications mast was built.) Although geologically part of the Alps, Mont Ventoux has been ostracized since no mountains of a similar height exist in-between. 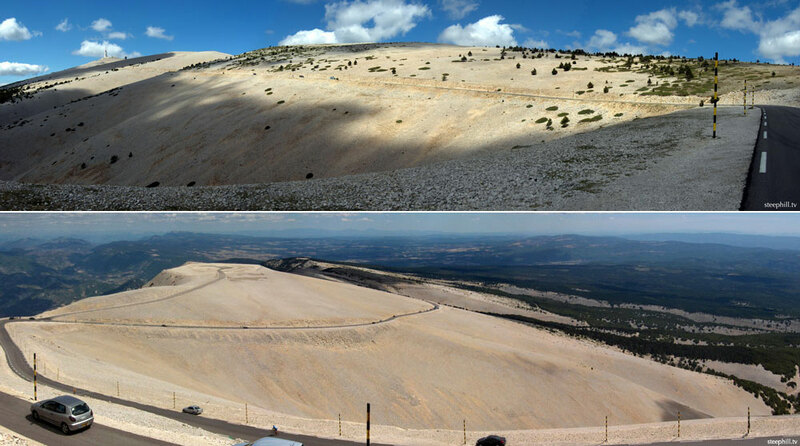 Mont-Ventoux means windy mountain where wind speeds as high as 320 km/h (or 193 mph) have been recorded. The wind and the steepness aren't your only enemies; the temperatures can be extreme. And Pro rider Tom Simpson learned in 1967 that it's not a good idea to consume alcohol and amphetamines before scaling Ventoux in the heat. But, even on a hot summer day, the top of the mountain can appear snow-capped due to its bare, white limestone. Ventoux was once forested, but it was stripped of its trees starting in the 12th century to meet the demands of local shipbuilders. Since 1860, some areas have been reforested with deciduous and coniferous trees including junipers higher up. Ventoux can be scaled by road bike from three sides, but the most popular option follows the usual Tour route and starts southwest in Bédoin. From Bédoin, the climb gains 1610 m over 22k for a average grade of 7.6%, but the last 16k average 9.1% giving it a well earned reputation as one of the hardest climbs in Europe. Luckily, the starting elevation is only 300m (1000 ft). Iban Mayo set the Ventoux record of 55'51" during a climbing time trial stage in the 2004 Dauphiné Libéré, and in the spirit of 24-hour extreme sport endurance events, a Frenchman climbed Ventoux eleven times in 24 hours starting from Bédoin in May 2006. Several months later, Rebecca and I climbed it on a beautiful day with little wind and warm temperatures so Rebecca was out to break Mayo's record. His record is still safe, but among the hundreds of riders attempting Ventoux on this day, only one rider passed Rebecca on the entire climb. Now, for those of you who don't know, Rebecca is a fine dancer and an excellent masher, but we were surprised at the number beginners out on one of the hardest climbs. Even on a hot day, don't forget to bring warm clothing because the long descent to Sault can be chilly. If you do the ride in July, you'll see and smell lots of lavender crops as you make your way to Sault, a good size town with lots of amenities and an ideal lunch stop. 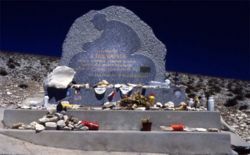 Learn more about Ventoux including its Tour de France winners and the two other routes to the top. 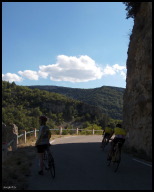 Located between Sault and Villes-sur-Auzon, Gorges de la Nesque should be slotted into the end of a Mont-Ventoux ride for a day you'll never forget. It's a really fun, scenic 19k descent on a twisty, tunnel-laden corniche with a perfect descending grade of 3%. It is now bypassed by the locals, so the only traffic you'll encounter are other cyclists and site-seers. <— Trust me... you'll be mortified. How about towing your kid to the top?